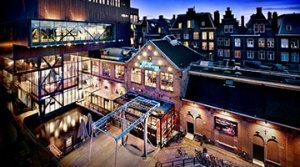 One of Amsterdam’s newest film festivals, The Bitcoin Film Festival, will take place on 2 December 2015 in cooperation with Bitcoin Wednesday and Bitfilm. This event is the second annual edition of the festival, and part of a worldwide tour of films about the digital currency revolution, currently being held in 16 cities, including Berlin, Saigon, Budapest, Mexico City, Montevideo and London. The Netherlands’ edition of the event will be held at the Melkweg, in the movie theater of one of Amsterdam’s best-known concert halls. It will feature a keynote by the South African Brett Scott, author of The Heretic’s Guide to Global Finance. Brett was a star in the recent episode of VPRO’s Tegenlicht, called “Het Bitcoin evangelie” about fanaticism of some of Bitcoin’s earliest adopters. In Tegenlicht Brett suggests that the digital currency revolution may be a consequence of the Occupy Wall Street movement.